Go into any feed store and you will see shelves lined with different bagged feeds for every imaginable type and age of horse. You will also see vitamin/mineral mixes and multiple formulated supplements for every possible horse ailment. Yet when you walk out back you will often see 1 or perhaps 2 types of hay available to meet the needs of all types of horses. On top of that, you are rarely supplied with any type of analysis on this hay to even determine if it is best for your horse. I like to test all my hay at www.equi-analytical.com. This company also has very good information about average levels of nutrients in many types of hay and feeds. It is nice to be able to compare your hay to other similar hay. Some feed dealers provide you with hay analysis but if not it is good to go directly to the growers and ask to test the hay before you purchase it. It is also good to talk to your grower about fertilizer and herbicide applications. We have convinced our hay growers that we don’t want any weeds in our hay but in reality we would be better to accept a few weeds if this can lower the chemical applied to the fields. Without knowing what nutrition is in your hay it is near impossible to evaluate the rest of your feeding program. For instance, your lactating broodmare needs a very different hay than an insulin resistant horse. Trying to guess the nutrition in your hay by looking at it is not going to help you. I have seen very good looking, leafy grass hay end up being very low in protein and needing minerals and I have seen brown, weedy hay test out with excellent nutrition. 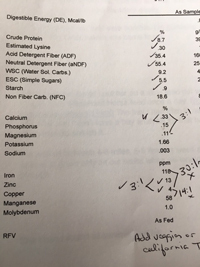 When evaluating your hay you will need to not only be concerned with the amounts of minerals but also the ratios of minerals. Growing horses and insulin resistant horses are the most sensitive to inappropriate ratios. High iron in much of the grass hay will also interfere with the assimilation of minerals such as copper. Copper can be low in grass hay so high iron levels can easily create a relative deficiency. Most formulated vitamin/mineral supplements will not balance hay and with high iron levels they can make the imbalance worse. Once I know the nutrition provided by the hay, I prefer to balance the hay with whole foods other than formulated supplements but some hays can be so out of balance that special mineral mixes are needed. California Trace is a mineral supplement that is designed to be used with hay that is too high in iron. Triple Crown Timothy Balance Cubes are also designed to replace or supplement high iron hay. These cubes can be a great hay replacement for insulin resistant horses because they are also guaranteed to be below 10 in simple sugars and starch. Veggies, such as winter squash and pumpkin can be good to balance hay that is only slightly high in iron. Pumpkin seeds also provide needed trace minerals without adding too much additional iron. Blue green algae is a great whole food supplement to replace the nutrition that is lost from hay after it is cut and dried but algae will not balance hay. When feeding veggies to horses it is important to start with very small amounts and rarely feed over a cup at any feeding. If you would like to have your hay and overall nutritional program evaluated I offer a nutritional consultation. At Holistic Horsekeeping we have a way to learn about caring for your horse holistically for everyone and any schedule. From courses to books to ebooks to audios, everyone can learn a variety of topics that will give a deeper understanding of horses and give you a happier, healthier horse. The self-paced online course is open to anyone interested in learning more about the Horse Temperament Types. It was created to share information about the eleven Horse Temperament Types as explained by Madalyn Ward, DVM. If you want to learn more about determining the temperament type of your horses, this course is the one for you. You can sign up and find more information at http://horsetemperament.com/class.html. Then see a wide range of topics covered in the books we offer, audios, DVD’s, and ebooks.